Gulkand, a sweet preserve of rose petals, is an ayurvedic medicine and Indian traditional recipe used for skin, constipation in pregnancy & kids, acidity, gastritis, ulcer, Indigestion, dysmenorrhea, acne, foul body odor, palpitation, hypertension, nosebleed, stress, etc. Gulkand is prepared from fresh rose petals and sugar. Other ayurvedic ingredients such as Praval Pishti and Mukta Pishti can also be added to boosts its action in hot season and diseases that occur due to excess heat. However, Gulkand can be prepared from any of rose variety or species. Almost all have similar medicinal value and uses. Rosa Centifolia and Rosa Damascena is considerably best for making Gulkand. For making Gulkand, you need following ingredients. Take 200 grams fresh rose petals and 100 grams sugar. Crush rose petals with hands. Grind the sugar crystals to make powder. Mix crushed rose petals and sugar together. Preserve the mixture in glass jar and keep under sunlight. You may need keeping under sunlight for a few days. In India, generally, people do not grind the sugar and crush rose petals. They just mix these two ingredients and keep it in a glass jar under direct sunlight. After a few days, sugar dissolves and mixes with rose petals. They start consuming the Gulkand. This method is without heating the rose petals. This method helps to preserve nutrients present in the rose petals. Take 200 grams of rose petals and 100 grams sugar. Crush the rose petals and grind the sugar crystals. Mix both ingredients in stainless steel pan. Heat the mixture until sugar and rose petals dissolves well. It will take 5 to 10 minutes. Now, let it cool down and then preserve the rose petal jelly in a glass jar. Take 100 grams rose petals and 5 teaspoons honey. Crush the rose petals and mix it with honey. Keep the mixture in glass jar under the direct sunlight. After 3 to 5 days, you Gulkand with honey will be ready to consume. If you prefer gulkand with honey, then do not heat the rose petal or honey. Ayurveda does not suggest heating the honey at high temperature, but you can keep the honey under sunlight. Note: Some people also use jaggery for making Gulkand. Rose petals contain 80 to 95% water content. The values provided below are based Gulkand prepared with method one using 100 grams sugar and 200 grams fresh rose petals. Disclaimer: The exact data for nutrition analysis is not available for Gulkand. Data provided here is just an estimate and calculation based on sugar content nutrition data and available data for nutrition facts of rose petals. All healing properties of Gulkand are attributed to Rose Petals. Almost all varieties of Roses used for making Gulkand have similar therapeutic actions. Rose flowers have following therapeutic properties. Health benefits of gulkand include its uses in various diseases that occur due to excess heat in the body or hot temperature outside. Diseases that occur due to excess heat are known as PITTA diseases in ayurveda. Gulkand is a best remedy for these diseases. Gulkand is best for mild to moderate constipation. Women can take gulkand during pregnancy because ayurveda consider it safe in pregnancy. In India, it is widely used for treating constipation that occurs in pregnancy. Gulkand softens the stool and its sugar content helps drawing liquids in the intestines, which ultimately helps to get rid of constipation in the pregnancy. Gulkand is natural remedy for kid’s constipation. It is also delicious and favorite among children. You may need giving Gulkand for several days to get a cure of constipation. In addition to Gulkand, include fiber rich foods such as fruits and vegetables in your kid’s diet. The regular intake of Gulkand prevents sunburn or sun poisoning that commonly occurs in summer season. It reduces the impact of excess heat on the body. Nosebleed in summer is a common issue in kids. Gulkand is a natural remedy that helps get rid of nosebleed. Give 1 teaspoon of gulkand to your children to prevent and treat nosebleed. Acidity is a common problem worldwide and many people have to take antacid drugs on empty stomach every day. Some feel burning sensation in throat, heartburn, sour mouth or throat, indigestion and stomach ache. You can get rid of all these problems using Gulkand in your daily life. You can eat Gulkand every day at night just before sleep. Ayurvedic physicians prefer giving Gulkand in between meal for treatment of gastritis and ulcers. Gulkand is a cool herbal preparation, which has cooling effects in the body. It reduces the occurrence of mouth ulcers and helps reducing burning sensation and pain in the mouth due to mouth ulcers. Some patients suffer with burning sensation after a bowel movement. Gulkand can help in this condition. It reduces acidity in the body, which a main cause of burning sensation. Other causes include spicy food and peppers. Gulkand helps in all conditions that cause burning sensation except intestinal worms. The most common cause of Hemorrhoids/Piles is chronic constipation and low fiber diet. However, other causes including pregnancy or chronic diarrhea may also play role in hemorrhoids development. Gulkand help reduce swelling of the hemorrhoids by providing mild laxative action in constipation. It also reduces the pressure in the lower section of the large intestine and lets the easier passage of the stools. It also provides strength to the veins, which helps restoring natural elasticity of the veins. The important thing is that Gulkand has little effects if disease progresses. It is only effective in mild causes of hemorrhoid (first-degree hemorrhoids), but it is highly effective in bleeding piles. It reduces habit of constipation and stops bleeding. In mild cases, the results appear within a week, but in severe cases, it may not alone effective solution and other remedies may also require. In bleeding piles or first-degree hemorrhoids, Gulkand can be taken in dosage of 2 teaspoons 2 hours after food two times a day with milk or water. Gulkand is a general tonic, which helps to reduce fatigue, muscle pain, burning, lethargies and mental stress. Many students in India using Gulkand for improving memory and reducing exam related stress. Gulkand also improves eyesight and helps in conjunctivitis. For conjunctivitis, it is used as adjuvant for other ayurvedic medicines. Above ingredients are mixed together and advised to take with milk in conjunctivitis. It reduces burning sensation and itching in the eyes. Cancer patients undergoing radiations therapy or chemotherapy are advised to take rose petal jam to reduce the side effects of these therapies. In spasmodic dysmenorrhea, sharp abdominal cramps occur at the start of menstrual flow. However, a mild pain on first day of menstrual period is normal, but when it starts causing troubles with daily life activities, then women need medication. Gulkand is a natural solution for this problem. It reduces abdominal cramps and pain during periods. Women suffering from this type of dysmenorrhea should take Gulkand on regular basis for at least 3 months. Gulkand helps to reduce foul smell and yellow discharge that occurs due to chronic infections, vaginitis or leucorrhea in women. Gulkand helps to get rid of burning sensation in soles and palms. It helps to reduces pain in heels. It reduces serum uric acid level, so it is beneficial for patients with Gout. It relieves mental stress and calms the mind. Gulkand is a mild laxative, so if you suffer with constipation, you should use this remedy first than trying strong laxatives. Gulkand also helps to reduce the side effects of antibiotics, painkillers and other strong drugs that cause nausea, burning sensation and ulcers. However, one can eat Gulkand without any adjuvant or with water, but cow’s milk is a best adjuvant for Gulkand in most of diseases especially in constipation. Water is good adjuvant for Gulkand in gastric problems. Gulkand is LIKELY SAFE for healthy individuals, pregnant women and lactating mothers. There are no side effects observed with the regular use of Gulkand for a period of six months. The only disadvantage of Gulkand is for diabetic patients. It is rich in sugar content, so it can increase your blood sugar level. Therefore, Gulkand is contraindicated in diabetes mellitus. What are benefits of gulkand for skin? Hi Johar, Burning sensation is a common symptom in some skin diseases. Gulkand can help reducing this symptom. It also helps in sunburn, as described in the article. Can we take gulkand during pregnancy. Is it safe for developing baby? Gulkand is POSSIBLY SAFE in pregnancy and it is also safe for developing baby. Eating Gulkand is very effective way to cure constipation with hard and dry stool. My child had constipation and stool was very hard and dry. He was always crying while passing stools. I have used Gulkand for a month and now I stopped it. He is now fine after a month course with Gulkand. Thank you, Dr. Jagdev for your valuable article. I am having gastric problem and burning problems in stomach and at the time of toilet. Please confirm shall I continue take the Gulkand daily or limited period. One can use Gulkand on regular basis because it is also a general health tonic. Secondly, it is not habit forming laxative. Actually, it maintains digestive health and corrects the gastric functions, balances acid production, cures heartburn, helps in GERD and improves functions of intestines and liver. Therefore, it also works in constipation because it softens the stools. The long-term use of Gulkand is LIKELY SAFE. What time best to take Gulkand for stomach heating problem and constipation? One can take it at night before sleeping. If the problem is chronic and obstinate, then Gulkand should be taken two or three times a day one hour after meal. 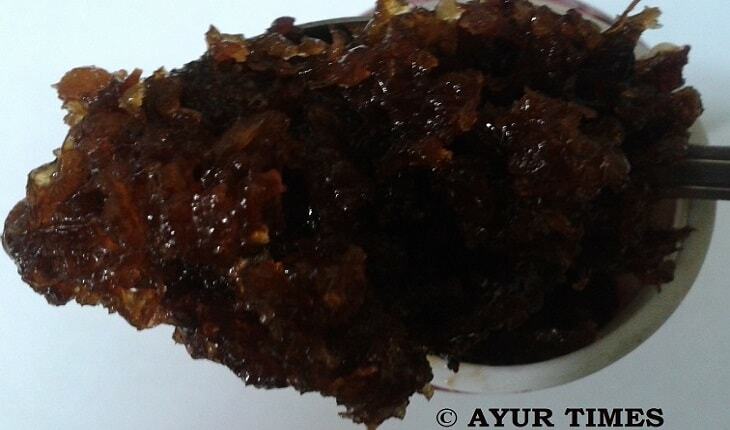 Does Gulkand help to cool down the body and remove heat boils, pimples and acne? How to take Gulkand and what about the sabja seed (sweet basil seeds). Does it also help to keep body cool? Can we take Gulkand in milk along with sweet basil seeds? 1. Gulkand is made of rose petals and sugar, so according to ayurveda, it has cool potency. It reduces body heat. It also a good blood purifier, which helps in pimples & acne. 2. You are referred to Dosage & Administration for How to Take Gulkand. 3. Yes, we can take Gulkand with milk and with sweet basil seeds. Can a person suffering from T.B. take Gulkand? Is it good for weight loss? T.B. patients can take Gulkand. It is tonic and reduces fatigue, restlessness, tiredness and sweating. It may not have direct influence on weight loss rather than a nutritional supplement. Sir, whether Gulkand will increase sperm count and motility by either directly or indirectly. Yes, Gulkand increases the count as well as motility. Are there any benefits towards the skin as we consume Gulkand? Gulkand increases skin glow, improves complexion and prevents skin diseases especially that occur due to heat or radiations. Due to mild laxative nature, the best time to consume Gulkand is just before sleep. Alternatively, one can also take it twice daily after meal. Can Gulkand help in weight gain? I want to increase my weight. I am 23 years and my weight is only 40 kg. Please do suggest if anything other than Gulkand can help. It may not have direct influence on weight gain, but it will provide nutritional support to the body and help reducing weakness and fatigue. The best remedy for gaining weight is Ashwagandha powder or its extract. Does Gulkand increase the complexion of skin in adults and kids? Gulkand improves complexion and prevents skin diseases like acne, blackheads, blemishes, dark circles etc. Is Gulkand an effective medicine for hemorrhoids/piles and bleeding piles? From which month can a pregnant women use Gulkand? Gulkand is indicated in constipation in pregnancy. If pregnant woman has constipation, it can be used in any month without any problem. Thanks for the article. Is it advisable to mix Gulkand in warm milk? Does mixing in warm milk affect its medicinal properties? Mixing Gulkand in lukewarm milk does not likely to affect its medicinal properties. In some cases, we advise to eat Gulkand with milk. Sir, if I take Gulkand with bread for breakfast, is there any side effects? Gulkand can be taken with bread. There are no side effects. Will the Gulkand help to get pregnant faster? Gulkand is likely to improve fertility and improves chances to conceive. Hello Sir, my name is Shilpa Apurva, I am a nutritionist n dietitian, presently working on Gulkand and I am quite successful in making four variation of gulkand to improve its nutritional value, your work helps me a lot as a reference for, how it is beneficial, some of my variations can be taken by diabetic patients as it’s sweetener is a complex one, my research is still going on. Tasting of my variations is also done and I am glad to share that all are well accepted by my selected tasting panel. Presently I am staying in Oman. I have a good day ahead n tc. Jai Shree Krishna, sir. Having Gulkand before food or in empty stomach cause any side effect? There are no side effects. Gulkand can be taken before meal or on empty stomach in the morning. Hi, I have a few questions. I will be very thankful to you if you can answer. 1. Can I make Gulkand with honey? 2. Can I eat Gulkand in pregnancy? Is gulkand safe during pregnancy? 3. Does gulkand improve complexion? 4. Does gulkand reduce body heat? 1. Yes, you can make Gulkand with honey. You can learn how to make Gulkand with honey in the above article. 2. Yes, Gulkand is POSSIBLY SAFE during pregnancy. Pregnant women can use Gulkand when they suffer from constipation. It is safer than Triphala and Senna bases laxatives. 3. Yes, it improves complexion and reduces black spots, blemishes and wrinkles. 4. Gulkand has coolant property, which means it produces coolness and reduces heat in the body after its digestion. Therefore, it is beneficial in diseases that occur due to excess heat such as burns, sunstrokes, heartburn, and acidity, burning sensation in the abdomen, burning urination and burning sensation on the skin. Is gulkand help to cover tinnitus? Gulkand is not indication for tinnitus. We don’t have information if it will work or not. Can gulkand induce urine? If a person having very less urine, can he use it? Treatment depends on the cause of problem. You should consult ayurvedic doctor.